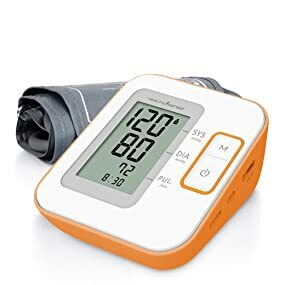 Buy Health Sense BP100 Heart Mate Classic Fully Automatic Digital Talking Blood Pressure Monitor (White/Orange) @ 56% Discount. 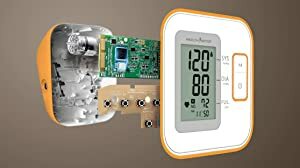 HealthSense is one of India’s fastest growing and leading health care brands based in Bangalore, with a wide product portfolio consisting of weighing scales, BP monitors, pedometer, massager, humidifier and more since its inception in 2014, we have been constantly striving to provide the best in class products for the health and personal care category, backed with innovative technology, quality, affordability and warranty, apart from professional after-sales support. We have been successfully evolving as a promising brand, keeping in pace with latest medical inventions and growing healthcare demands. We, the HealthSense Team are committed to the well-being of your sweet home with our motto “We Care Health”. 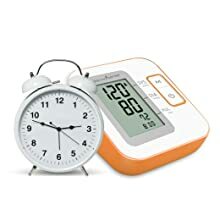 Designed to perfection and driven by its good looks, Heart-Mate Classic BP-100 draped in bright orange and white body is an ideal partner in order to meet today’s lifestyle demands of conscious and healthy monitoring of blood pressure. Equipped with latest Oscillometric technology, the monitor has a user friendly interface with a large display screen to show your BP results in legible, black characters for easy reading. 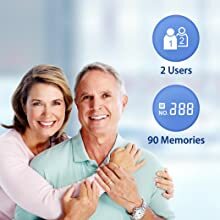 It incorporates “talking function” – a distinctive feature, giving vocal guidance of instructions, BP results & compliance which makes Heart-Mate, a heart caring device true to its form. Unique feature, where a pleasant voice reads aloud in English language. Know how complaint is your BP reading with WHO guidelines – Low, Normal, High as per the classification, which makes Heart-Mate more reliable & trustworthy. *This information is for customer convenience only. 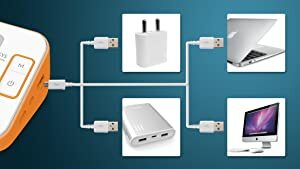 Adapter & USB cable not of package. State-of-the-art technology conjugally bonded with WHO compliance assures improved device accuracy and consistently precise readings. Now there is no need to panic due to skipping a medication or reading. 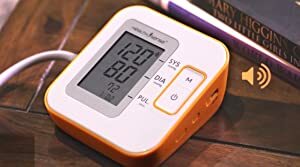 Heart-Mate, with its built in alarm feature will efficiently remind you that it is time for a BP reading or to take medicines. Alerts you to remain still or retake a reading due to shaking or movement of body during measurement. Frequent indication may be signal of cardiovascular disease or call for a doctor’s visit. No more manual records as it consists 2 user memory that is capable to record 90 readings each. This time-lapse picture of the pressure variations will help you to ensure a healthy heart. 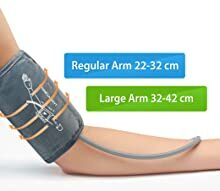 Accompanied by a wide and large arm cuff with a circumference of 22-42 cm to fit both regular and large sized arms for a more comfortable and accurate reading. Home monitoring helps keep good track of Hypertension & Arrhythmia, thereby sustaining a healthy heart. Court on the benefits. High blood pressure/Hypertension is the biggest known cause of disability and premature death throughout the world in the form of renal failure, stroke, heart attack and heart diseases. Hypertension typically has no symptoms and therefore needs utmost care and constant monitoring. 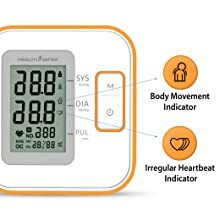 As we HealthSense, care for your healthy heart – we have HealthSense Heart-Mate Digital BP Monitor which will assist you in maintaining your blood pressure levels. Our device is highly accurate in monitoring hypertension and also detect irregular heartbeat. It has the unique TALKING function-the first of its kind in India and is easy to operate without training and can also be used in noisy environments. 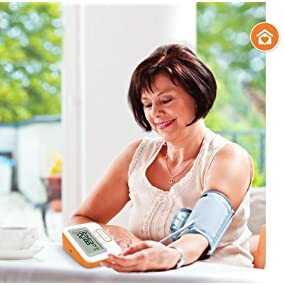 Best Cheap Deals For Health Sense Health & Wellness, Grab Cheap Health Sense BP100 Heart Mate Classic Fully Automatic Digital Talking Blood Pressure Monitor (White/Orange) Online.